Here we go with a handle build for the Disston D8 series handsaws. These are difficult to replace due to curved cuts that must be made in the plate seating slit. I am attempting to solve this problem and in the process gain a few D8 and D23 handles for myself. Hopefully, it will help others. The problem devolves down to having to make up a circular saw of correct diameter that is of correct thickness along with a suitable mandrel to hold the circular saw while the cut is made in the D8 handle. I will update this thread as I finish each stage of the project. I fished through my stack of old circular saw blades and found a 6 3/8 dia. blade from Black and Decker. It turns out by sheer serendipity that it is a very close match in diameter for the curve on the Disston saw plate. It is 0.059 thick, so I will have to thin it down some. I need it at about 0.045 or so… since the saw plate mikes out at about 0.035 in the handle region. Hammering out the set in the teeth of the saw. It won’t be perfect, but if all goes well, I can clean it up when I thin the blade down. Rummaged through my scrap pile and found a chunk of 1 1/2 inch 416 stainless which looks like it wants to be a mandrel. Start gnawing through the steel to make up a mandrel to hold the circular saw. I will turn the shank of the mandrel down to 0.750 so that it can be mounted in a 3/4 R8 collet in my small vertical mill where I will do the sawing in the handle. This may be a bit confusing to anyone who has not attempted to make a handle for a Disston D8 saw. These are very desirable handsaws but it is a beast trying to make up a new handle for them. There are a fair number of good D8 saw plates out in the wild that have no handle or a replacement handle that is not correct. That’s really what this is all about. I’m not really sure I will be able to pull this off, so bear with me. Got the arbor machined down to size, now drilling to enable tapping for 3/8 x 16 hex bolt. Completed arbor for the circular saw set up to mount in a 3/4 R8 collet so that it can be used in a slow turning vertical mill and can be fed precisely into the desired cut on the new D8 handle. Also cut a recessed “doughnut” that will spread the pressure out some from the bottom. We are finished with the arbor and it is ready to be used. Next, I have to thin the circular saw blade down to 0.045 or so to keep the kerf in the new handle from being too wide. Once the saw blade is thinned down, I start cutting wood for the handle. Circular saw blade is finished. It is 0.042 thick and runs more or less true. No set in teeth. This saw blade was not even remotely the same thickness over the face of the plate. I guess the manufacturer didn’t really care and relied on the set in the teeth to compensate. The other lesson learned is that these saw blades are made from an alloy that has a lot of chromium and probably nickel in it. They are not very hard, but are very difficult to machine due to work hardening at the surface. Next time I will use a surface grinder. Now the project is ready to cut some wood for the D8 handle. I will laminate the first handle simply because I don’t know how this is going to work out and I do not intend to risk one of my blocks of black walnut that has been drying in the barn for 25 years. Ok, got a reasonably good template for a D8 Thumbhole. Went back to work and started cutting some wood. Rummaged through some walnut scraps and found this piece that has a couple of defects, but should serve well enough for a prototype. I was hoping to be able to avoid the voids, but that was not the case. Do some work with the bandsaw using 1/4 blade to cut it down to size….then drill some holes for the various radii to make the next cuts easier. I am going to leave it a bit “fat” in a couple of areas just because I would like some insurance. Used coping saw and scroll saw to knock out the thumb hole and interior of the handle. Now ready to do some rasp work. Here is the setup in the small mill with the circular blade mounted on its arbor. The D8 handle will be bolted to the 1-2-3 block that is mounted in the mill vise flush with the surface of the vise jaws. Handle mounted and ready to cut the slit. I cut most of the slit today, but had to stop. I did not thin the blade far enough towards the hub, so not enough room to finish the cut. The blade cuts very well and the slit is just barely wide enough for the D8 plate. Friction fit. Running the mill at 240 rpm, which is still fast enough to make some smoke even with paraffin wax on the blade. I am sure the circular saw blade needs at least a bit of set in the teeth to keep friction down in the cut. 0.010 worth of set would do wonders for this setup. More tomorrow after I work on the circular saw blade some more. A comment from Bob Page, Go super slow with that blade, James. With that much positive rake on the teeth, it might want to grab. If it does, consider making another blade with about 20 degrees of negative rake. Instead of setting the teeth, consider undercutting the plate by a couple of thousands to gain some clearance in the cut. I’d also slow it down to about 100 rpm. James A Ruble Bob Page Excellent idea, but that mill is a belt drive and 240 rpm is as slow as it gets. Right now, I’m thinking of moving the setup over to the CNC mill with its VFD which I can run about as slow as I want. You are absolutely correct about the positive rake. To get around the grabbing, I used a super slow feed. All in all, this setup is not optimal. Since I’m going to have to mount the circular saw back onto the lathe face plate, I might as well do some under cutting on it as well. That would help a bunch with the heat buildup, I think. Bottom line is that I think I will make up a new circular saw from scratch with your recommendations in mind. Probably should have done that from the start, but I was trying to get away with using that blade. Live and learn….there ain’t no such thing as a free lunch. Did some more hacking on the circular saw blade. Took Bob Page‘s advice and put in 0.010 undercut in the blade and finished cutting the remainder of the hub down to size so I could finish the cut for the slit. Turned out that it all worked very well. Still gets a bit warm when making the cut, but nothing like before the undercut. The handle fits on the D8 plate more or less correctly now and there is plenty of room for the saw nuts etc. You can see that the template that I used needs more meat on the lower part of the cheek to be correct by looking at the shadow line from the previous handle. This is really a guess, though, since the previous handle may not have been a Thumbhole handle and I have nothing to compare with now. At any rate, it works and feels pretty good. Now I will start on a set of saw nuts. I will probably just make up flat nuts for now and think about cutting domed nuts later since I will need to make up a fixture for the lathe to be able to make a good domed saw nut. That is a project for a later date, I think. Bob Page It looks very good! Remember that saw handles were cut and shaped by hand at the factory, so no two saws are identical. The holes were drilled through the plate and handle after they were assembled, so again the hole placement will be different from saw to saw. The shadows on the plate should disappear with more polishing. 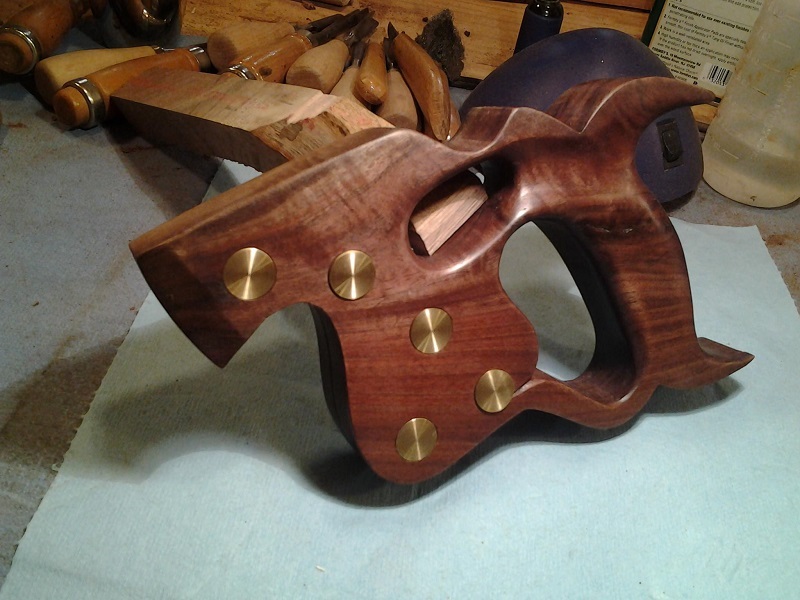 So….here is the completed D8 Thumbhole handle ready to mount on the saw plate. Saw nuts are complete, it fits the plate like a glove and is rock solid. I left the small defect in the handle to remind me to watch for voids in the future. Finish is Formby’s Tung oil and Johnson’s floor wax. I’ll mount it when I get the saw plate cleaned up a bit and filed. The plate is 8 points and I will keep it and file it to rip since that would be in the spirit of the thumbhole handle and besides, I have at least 10 pretty good saws that are 8 point crosscut right now. This just about winds it up for this project. Hope everyone enjoyed my stumbling around and trying to get this saw restored. Here is a shot of the saw nuts as I make them. They are identical when they come off the lathe except that the cylindrical portion of the shank is a few thousands larger in dia. for the ones destined to be male. This allows them to be a rather tight friction fit in the holes bored for them in the handle. This shot shows how I make the male screws. Both female and male are drilled and tapped on the lathe for 10-24 threads. I put a 10-24 screw into the new saw nut and put red loctite on them. Then cut off what I don’t need. The female saw nuts are slotted on the mill using a bog standard mill saw mounted on a small arbor. The saw nut is held in an ER16 collet mounted in a 5C collet which is in turn mounted in a collet block held in the mill vise. The holes in the handle are counter bored using a 9/16 4 flute end mill mounted in a drill press. I use the original drill to get alignment and then switch to the end mill after I clamp the handle down in the drill press. Previous post Who Made the Pressed Steel Frog Bench Planes.